On 31 July 2002, Olimpia overturned a first-leg deficit against São Caetano to win their third Copa Libertadores on penalty kicks. São Caetano, only two seasons removed from the Brazilian second division, had shocked Olimpia by winning 0-1 in the first leg, played in Ascunción the week before, with the lone goal coming from midfielder Ailton Delfino in the 61st minute. 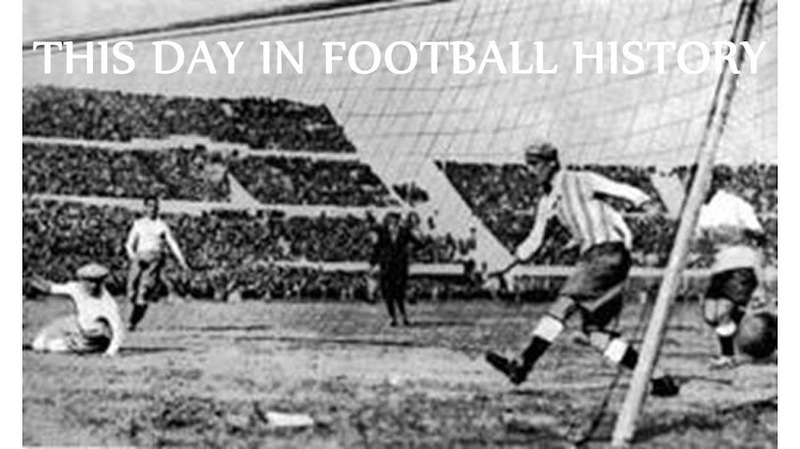 Hosting the second leg in São Paulo, they compounded the shock by again going up 1-0 with another goal from Delfino in the 31st minute. But, this time, the Paraguayan side fought back. In the 59th minute, midfielder Gastón Córdoba drove a shot across the face of the goal and into the far corner. Then, ten minutes later, forward Richard Báez evened things up with a looping header. The teams remained level for the remainder of the match to force a decision by shootout. Penalties were familiar to both teams in the tournament, as São Caetano needed them to get past Católica in the Round of 16 and Peñarol in the quarterfinals, while Olimpia used them to advance over Grêmio in the semifinals. In the final, São Caetano started the shooutout and, after two kicks each, the teams were even at 2-2. But then both midfielder Marlon da Silva and defender Serginho sent their kicks for São Caetano over the bar. With Olimpia then leading 2-3, forward Mauro Caballero blasted his shot right down the middle, beating goalkeeper Silvio Luiz for the win. 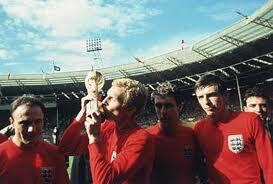 On 30 July 1966, England won the World Cup, beating West Germany 4-2 in extra time thanks in part to a controversial goal. Played before a crowd of 98,000 at London's Wembley Stadium, the match featured an early exchange of goals from a pair of strikers, West Germany's Helmut Haller (12') and England's Geoff Hurst (18'). After that, though, the goals dried up. Although both sides playing aggressive attacking styles, goalkeepers Gordon Banks and Hans Tilkowski repeatedly denied chance after chance. English midfielder Martin Peters finally beat Tilkowski to break the stalemate in the 78th minute and the hosts looked certain to win at the end of regulation. But in the 89th minute, a loose ball in the England box fell to center back Wolfgang Weber, who drove it home with a sliding shot to send the match into extra time. There, England continued to press and were rewarded in the 101st minute when Hurst took the ball on the edge of the area and fired it over Tilkowski. The ball struck the crossbar and bounced straight down before a West German player headed it out of play. The referee blew the whistle and conferred with his linesman before awarding the goal. Replays remain inconclusive, but suggest that the entire ball had not crossed the line. In any event, Hurst completed his hat-trick in the 120th minute to seal the win. Despite the eventual margin of victory, controversy continues to surround Hurst's second goal. In 1996, two engineers at Oxford University published a paper claiming that the entire ball had not crossed the line, missing by just 6 centimeters. On 29 July 2000, the Columbus Crew hosted the highest-scoring MLS All-Star game ever, as East beat West 9-4 with goals from eight different players. 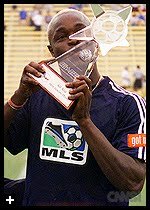 The 2000 edition was the fifth MLS All-Star Game and the fourth to feature East versus West (the 1998 game pit US all-stars against world all-stars). And the East had enjoyed more success, winning three matches to the West's one. 2000 provided more of the same. Played before a sellout crowd of almost 24,000 at Columbus Crew Stadium, the East wasted no time, setting the pace with a 2nd-minute goal from MetroStar forward Clint Mathis. But the West scored a quick flurry of goals from Chicago Fire striker Ante Razov (17', 22') and Los Angeles Galaxy midfielder Mauricio Cienfuegos (19') to take a 3-1 lead. By the break, the East had narrowed the gap, but the West still led, 4-3. The second half belonged to the East, who received goals in the 51st, 59th, 61st, 65th, 67th, and 76th minutes to claim their fourth win over the West in convincing fashion. Tampa Bay Mutiny star Mamadou Diallo (pictured) claimed Man of the Match honors with two goals and an assist. A full list of the scorers is below. East: Clint Mathis (NY/NJ) 2'; Jaime Moreno (DC) 36'; Adolfo Valencia (NY/NJ) 39'; Mark Chung (NY/NJ) 51'; Mamadou Diallo (Tampa Bay) 59', 61'; Jay Heaps (Miami) 65'; Dante Washington (Columbus) 67'; Brian McBride (Columbus) 76'. West: Ante Razov (Chicago) 17', 22'; Mauricio Cienfuegos (LA) 19'; Piotr Nowak (Chicago) 44'. On 28 July 1925, Juan Alberto "Pepe" Schiaffino was born in Montevideo. Widely regarded as one of the greatest players to come out of Uruguay, he went on to star for Peñarol and AC Milan and played for both the Uruguayan and Italian national teams. He began his professional career in 1943 with his hometown team, Peñarol, and stayed with them for twelve seasons. An inside forward and a gifted passer, he scored 88 goals in 227 league appearances for the club and helped them to six national titles (1944, 1945, 1949, 1951, 1953, 1954). During that time, he also made his first full international appearance, playing for Uruguay in a 1-1 draw with Argentina in December 1945. He scored eight goals for Uruguay in 23 appearances and starred for them in two World Cups, including the 1950 World Cup title match against Brazil, which Uruguay went on to win, 2-1, after Schiaffino scored the equalizer in dramatic fashion. In 1954, he moved to AC Milan for the then-world record fee of £72,000. 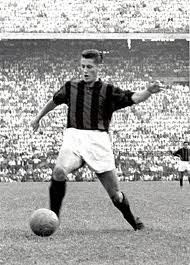 He was an instant success in Italy, scoring a brace on his debut and leading Milan to the 1955 Scudetto, the first of four league titles in his six seasons there. In 1958, he scored the opening goal of the European Cup Final, though Milan eventually lost to Real Madrid 3-2 after extra time. When he moved to Milan, he also moved his national team allegiance to Italy, making four appearances for them between 1954 and 1958. He finished his playing career with Roma, where he played from 1960 to 1962. He later returned to Uruguay, where he went on to manage both the national team (1974-75) and Peñarol (1975-76). He died in 2002, shortly after being named Uruguay's Player of the Century. On 27 July 2007, Chelsea captain John Terry became the highest-paid player in Premier League history. For a while, anyway. The Blues had just completed a three-year run in which they won the league twice (2005, 2006), then finished as runners-up to Manchester United (2007). They also won the FA Cup and the League Cup in 2007. Terry, who was also the England captain at the time, had two years remaining on his existing contract that paid him a reported £67,000 per week, well behind teammates Michael Ballack and Andriy Shevchenko, who were both earning close to £120,000. Terry's contract negotiations dragged out over a couple of months, but the defender maintained throughout that he had no intention of leaving the club. In July, Chelsea rewarded his loyalty with a new five-year deal that paid him close to £135,000 per week to surpass the record previously held by Ballack and Shevchenko. But Terry's status as the league's best-paid player did not last long. In August 2008, Chelsea signed midfielder Frank Lampard to a new deal worth £140,000 per week (which triggered an increase in Terry's pay to the same level). Currently, Wayne Rooney is the Premier League's highest player with a deal worth a reported £260,000 per week. On 26 July 2003, winger Bobby Convey scored his first and only international goal to lift the United States over Costa Rica in the CONCACAF Gold Cup's third-place match. Although he was only 20 years old at the time, Convey had already developed a resume full of potential. 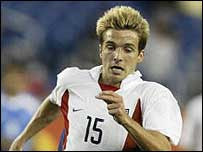 He joined DC United in 2000, making him the youngest signing in MLS, then earned his first full international cap that same year. By the time he played against Costa Rica in the Gold Cup, he was captain of the U20s and had played in all but one of the senior side's matches that year. The US had advanced to the semifinals in the tournament, but lost to Brazil 2-1 in extra time. That put them into the third-place match against Costa Rica, who had been eliminated by Mexico. Playing at the Orange Bowl in Miami, Costa Rica took a 2-1 first-half lead with a brace from striker Rolando Fonseca (24', 39') sandwiched around a goal from US defender Carlos Bocanegra (29'). But the Yanks rallied in the second half, drawing level with a 56th-minute strike from midfielder Earnie Stewart, then taking the lead 11 minutes later. The match-winner started with Landon Donovan, who split the defense with a perfect ball. Convey latched on to it and fired it home with a left-footed blast from the edge of the penalty area. Convey went on to earn a total of 46 caps between 2000 and 2008, but never scored another international goal. On 25 July 2009, Bordeaux won the Trophée des Champions by beating Guingamp 2-0, with both goals scored by players named Fernando. The tournament, which started in 1995 but traces its roots back to 1949, pits the previous season's Ligue 1 champions against the reigning Coupe de France holders. The league champions were Bordeaux, who had also won the Coupe de la Ligue that season. They were up against Ligue 2 side Guingamp, who had defied the odds by defeating several Ligue 1 clubs, including Rennes, Toulouse, and Le Mans, on their way to the Coupe de France title, despite finishing in the bottom half of Ligue 2 that year. For the first time, the match was played outside of France. In order to promote French football overseas, the teams met at the Olympic Stadium in Montreal, where a crowd of over 34,000 turned out to watch. 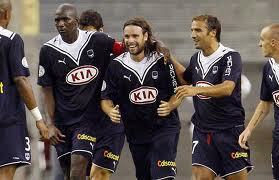 Bordeaux took a first-half lead with a goal from forward Fernando Cavenaghi (pictured, center) in the 39th minute. Guingamp's tight defense managed to keep the margin close, but midfielder Fernando Menegazzo, who had come on as a second-half substitute, scored in the 90th minute to seal the victory. It was Bordeaux's second consecutive Trophée des Champions and their third overall. On 24 July 1998, the FA granted Arsenal's request to move their upcoming Champions League matches from Highbury Stadium to Wembley. Although the switch allowed the Gunners to play before a larger audience, it proved to be an unwise decision. At the time, Wembley had a capacity of about 70,000, almost double that of Highbury. In defending the move, Arsenal issued a statement claiming that "[i]f the matches were to be played at Highbury, more than 6,000 season ticketholders, junior Gunners and concessionary groups would have been relocated to other parts of the ground" and that "[m]any thousands of Arsenal supporters would have been excluded from the games completely." Manager Arsène Wenger supported the venue change, but noted the risk, saying "[w]e may be less comfortable at Wembley, but it is a big occasion to play there and we will have more support." And, indeed, the Gunners struggled in their matches there. In two Champions League seasons, they played a total of six matches, winning two, drawing two, and losing two, and failed to advance out of the group stage both times. 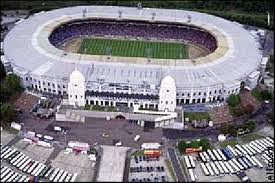 In preparation for the construction of a new Wembley, the original stadium was closed in 2000. Arsenal's Champions League matches returned to Highbury, where they went undefeated in the tournament, though they were eliminated by Valencia in the quarterfinals under the away goals rule. On 23 July 2009, Motherwell overcame a first-leg deficit to advance out of the Europa League second qualifying round by beating Albania's Flamurtari Vlorë by the commanding score of 8-1. It was the second straight appearance in the tournament for Motherwell, who entered the competition in the first round the previous year, but failed to score a single goal and were promptly eliminated by AS Nancy. For the 2009-10 edition, they entered in the first qualifying round where they beat Llanelli (3-1 on aggregate). That win sent them into the second qualifying round to face Flamurtari Vlorë. The Albanians hosted the first leg, winning 1-0. But the second leg was a completely different story. Played at Excelsior Stadium in Airdrie because Motherwell's Fir Park ground was closed for summer repairs, the hosts were up 6-0 before the break, including a hat-trick from striker Jamie Murphy (pictured) (16', 19, 34'). The scoreline could have been worse, as Motherwell missed a slew of chances, but by the time Flamurtari got on the scoresheet in the 65th minute, the Scots were up 7-0. Then striker Robert McHugh added another in the 72nd minute to cap the victory. Unfortunately for Motherwell, they went out in the third qualifying round after losing to Steaua Bucureşti, 6-1 on aggregate, but the 8-1 result against Flamurtari remains their biggest margin of victory in European competition. 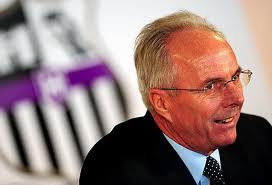 On 22 July 2009, Notts County introduced Sven-Göran Eriksson as their new director of football. It marked a return to England for the Swede, who had previously managed the English national team and Manchester City, but it did not last long. Eriksson, who had enjoyed success as a manager in Sweden, Portugal, and Italy before taking the England job in 2001, had just finished a disappointing 8-month stint in charge of Mexico's national team, promised big things for Notts County, then in League Two. According to Eriksson, the club's new owners, a Middle Eastern finance consortium, were determined to send Notts County to the Premier League. They demonstrated their commitment by signing a couple of high-profile players in Manchester City goalkeeper Kasper Schmeichel and Portsmouth center back Sol Campbell. Eriksson moved on to manage several different teams, including the Côte d'Ivoire (2010), Leicester City (2010-11), and Guangzhou (2013-14) before joining his current club, Shanghai SIPG, in 2014. On 21 July 1960, striker Trevor Ford returned to Great Britain after serving a three-year ban related to an illegal payment scheme. A Welsh international considered by many to be one of the greatest forwards of his era, Ford once set a British transfer record for his position when Sunderland paid £30,000 to sign him from Aston Villa in 1950. He justified the expense by scoring 67 times in 108 league appearances. After three and a half seasons, he moved to Cardiff for a club-record £29,500. After retiring in 1956, he published his autobiography, I Lead the Attack, in which he claimed to have been involved in an illegal payment scheme while at Sunderland. The Football League pressed him for details and his refusal to provide any information led them to ban him from the league. He came out of retirement in 1957, but had to go overseas due to the ban. 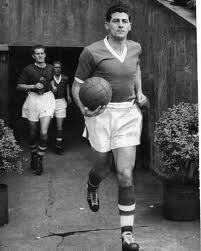 He signed with PSV Eindhoven and stayed there until the Football League lifted the ban in 1960. Upon his return, he signed with Division Three side Newport County, though he made only eight appearances and scored only three goals before ending his league career after the season. On 20 July 2007, midfielder Francesco Totti formally announced his retirement from the Italian national team, leaving them with 58 caps and one World Cup trophy. 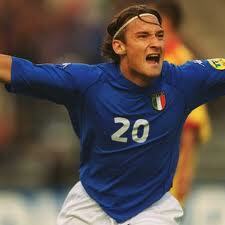 Totti joined the senior side in 1998 after winning the UEFA U-21 European Championship two years earlier. He proved instrumental in Italy's Euro 2000 campaign and was named man of the match for the final, despite losing to France. His next two major tournaments did not go as well, with Totti getting ejected in Italy's second-round loss to South Korea in the 2002 World Cup, then receiving a three-match ban after spitting on Denmark's Christian Poulsen in the opening match of Euro 2004 as Italy were eliminated in the group stage. He almost missed the 2006 World Cup after fracturing his fibula in February 2006, but recovered from the injury in time and played in every match for Italy. He started every match except against Australia in the Round of 16, where he came on as a substitute to score the match-winning goal from the penalty spot in the 5th minute of stoppage time. His performances earned him a spot on the tournament's All-Star team. He debated retiring from international duty after the World Cup, but held off on the decision for over a year before finally stepping down to concentrate on his upcoming Serie A season with Roma. Although Totti suffered a season-ending knee injury in June 2007, Roma went on to win the Coppa Italia, making Totti the most successful captain in club history. On 19 July 1908, a football club named Wilhemina was founded in a Rotterdam pub. 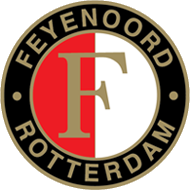 Now known as Feyenoord, they have become one of the most successful clubs in the Netherlands, with a slew of domestic and international titles, including the 1970 European Cup. The original name last less than a year, but they went through a couple of others--Hillesluise FC and RVV Celeritas--before becoming Feijenoord in 1912 after their local borough in Rotterdam (the club amended the name to "Feyenoord" in 1973). Success followed shortly afterward, as they claimed their first league title in 1924, then captured four more (and two Dutch Cups) by 1940. Since the establishment of the Eredivisie in 1956, Feyenoord have won an additional nine league titles, most recently in 1999. Their total haul of 14 places them third among Dutch clubs, behind only Ajax (30) and PSV Eindhoven (21). After winning the league in 1969, Feyenoord entered the 1969-70 European Cup and defeated Celtic in the final to become the first Dutch club to win a major European trophy (though they were quickly caught then passed by Ajax, who won the next three tournaments). They went on to win that year's Intercontinental Cup and later added two UEFA Cups (1974, 2002) to their international honors. Their league and international form dipped after 2002, but they continued to collect silverware by taking the KNVB Cup in 2008 and 2016. They remain one of the few clubs never to have been relegated out of the Eredivisie. On 18 July 2007, MLS Commissioner Don Garber announced that the San Jose Earthquakes would be returning to the league after a two-year absence. 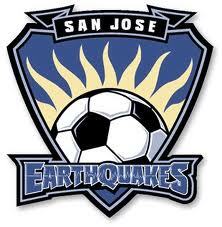 The Earthquakes were one of the ten founding members of MLS, though they were initially known as the San Jose Clash. In 1999, they changed their name to the Earthquakes, taking it from the defunct NASL team. Two years later, driven by manager Frank Yallop and midfielder Landon Donovan, they won their first MLS Cup, then repeated as champions in 2003. Despite their success, frustration over their inability to build a soccer-specific stadium led the owners to move the team to Houston for the 2006 season. MLS, however, decreed that the team's name, colors, and records would remain in San Jose while the Houston team was rebranded as the Dynamo and went on to win the MLS Cup in 2006 and 2007. The league added Toronto as an expansion team in 2007, then, when the time came to add another team for 2008, selected San Jose. The new Earthquakes joined the league for the 2008 season and finished dead last, with only eight wins out of thirty matches. Although they have yet to replicate the success of their previous incarnation, they reached the MLS Cup semifinals in 2010 before losing to that season's eventual champions, Colorado, and had the league's best record in 2012. On 17 July 1994, Italy lost the World Cup Final in a penalty shootout to Brazil when their top scorer of the tournament, Roberto Baggio, sent his attempt over the bar. Simply making it to the Final was a minor miracle for Italy, who opened their tournament campaign with a first-round loss to Ireland. And, as the fourth-best third place team in the group stages, they were the last team to qualify for the knockout rounds. Baggio, who had won the 1993 Ballon d'Or and FIFA World Player of the Year award for his UEFA Cup-winning season with Juventus, shined in the later rounds, scoring five goals--three of them match-winners (against Nigeria, Spain, and Bulgaria)--to take Italy to the final. 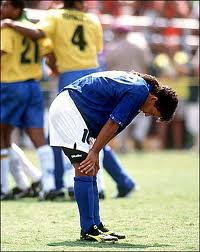 Baggio's scoring streak dried up in the final, as it did for Brazil's top scorer Romário (who was also on five goals for the tournament). With the match scoreless at the end of extra time, the teams went into penalty kicks to decide the winner. After four kicks each, Brazil were up 3-2 when Baggio stepped up to the spot. It was his second penalty attempt of the tournament, as his match-winner against Nigeria had come from the spot in the 102nd minute. But this time, he fired the ball over the bar to end the match and give the trophy to Brazil. He returned to the World Cup with Italy in 1998 to become the only Italian player to score in three different World Cups and his total of nine World Cup goals remains an Italian record. On 16 July 2008, the United States women beat Brazil in a pre-Olympics friendly, but lost Abby Wambach, their leading scorer, who suffered a broken leg. Played before a sold-out crowd of 7,502 at San Diego's Torero Stadium, the match was the second contest between the two teams in four days and the last for both teams before they headed to China for the Olympics. The US had won the earlier match 1-0 and were hoping for a repeat performance. Those hopes took a blow in the 31st minute when Wambach--the leading scorer for the US that year with 13 goals and 99 goals in her international career--collided with Brazilian defender Andreia Rosa and immediately waved for the medical staff. She was taken straight to the hospital where x-rays confirmed fractures in her tibia and fibula. Despite the loss of Wambach, the Americans continued to press Brazil and were rewarded with an 85th-minute goal from substitute Natasha Kai for the 1-0 win. Brazil and the US met again in the gold medal match in Beijing where the US won again by the score of 1-0. Wambach missed the tournament, but returned to the US team in May 2009 and scored her 100th goal in July of that year. She extended her tally to a record 184 while winning the 2012 Summer Olympics and the 2015 Women's World Cup. 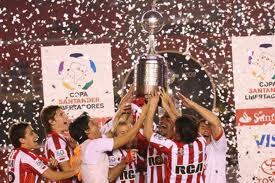 On 15 July 2009, Estudiantes won the Copa Libertadores, beating Cruzeiro over two legs. The title was their fourth, coming 39 years after their third. The Argentinian club had dominated the competition in the late 1960s and early 1970s, winning three straight titles in 1968, 1969, and 1970. They also made it the Final in 1971, but lost to Nacional. Cruzeiro, meanwhile, had also done well, winning the tournament in 1976 and 1977, as well as finishing as runners-up in 1977. The two teams met at the start of the 2009 tournament in the group stage. They split their two meetings, with Cruzeiro winning the first 3-0, then Estudiantes winning the second 4-0. The Brazilians went on to top the group, with Estudiantes close behind in second place. Estudiantes hosted the first leg of the final on 8 July, resulting in a scoreless draw. For the second leg, they played at the Mineirão in Belo Horizonte before a crowd of 65,000. The first half was another close--and physical--contest, as the teams again failed to score while accumulating a total of three yellow cards (one for Cruzeiro and two for Estudiantes). Cruzeiro took a second-half lead with a 52nd-minute goal from midfielder Henrique, but Estudiantes quickly equalized when forward Gastón Fernández found the net five minutes later. The visitors started to dominate the midfield, with Juan Sebastián Verón orchestrating the attack. It paid off in the 72nd minute, as Estudiantes forward Mauro Boselli provided the winning score. Verón was named man of the match for his efforts. The win placed Estudiantes fourth in the list of most Copa Libertadores titles, behind fellow Argentinian clubs Independiente (7) and Boca Juniors (6), as well as Uruguayan club Peñarol (5). On 14 July 2006, an Italian football federation panel announced the punishments for the Calciopoli match-fixing scandal, including relegations for Juventus, Fiorentina, and Lazio. The announcement was the result of a police investigation into the 2005-06 Serie A season that found all three clubs, plus AC Milan, guilty of fixing matches by bribing referees. The prosecution requested relegations and points deductions for each club, reserving the harshest penalties for Juventus. The Turin club's general manager, Luciano Moggi (pictured), was a central figure in the collusion, which resulted in Juventus winning the Scudetto for 2005-06. Although the prosecutors requested that Juventus be demoted at least two levels, the panel's sanction dropped them only to Serie B. They also stripped Juventus' 2005 and 2006 league titles and docked them 30 points for the upcoming season. Fiorentina and Lazio were relegated as well, while Milan escaped with a relatively minor points deduction. 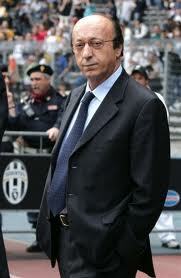 The Juventus board resigned en masse, while Moggi received a lifetime ban. After the appeals process, the punishments were reduced. Juventus ended up as the only club relegated--for the first time in club history. The points deduction was lowered from 30 to 9, however, and they won promotion back to Serie A for the 2007-08 season. 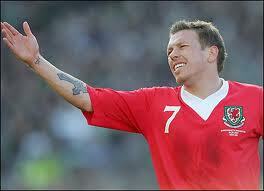 On 13 June 1979, former Wales captain and famously volatile striker Craig Bellamy was born in Cardiff. He spent the majority of his career in England, with brief loan spells in Scotland and Wales. Bellamy began his professional career in 1996 with Norwich City and established himself as a regular first-teamer by his second season. But after 32 goals in 84 league appearances, he drew substantial interest from other clubs, eventually moving to Coventry City in 2000 for a transfer fee of £6.5 million. Then, when Coventry were relegated at the end of his first season there, he moved on Newcastle. He did well on the pitch at Newcastle, scoring 14 times in his first season, but he fell out with members of the coaching staff and several players, including his strike partner Alan Shearer. Manager Graeme Souness sent him out to Celtic on loan for the second half of the 2004-05 season. Afterward, he spent time with Blackburn Rovers (2005-06), Liverpool (2006-07), West Ham (2007-09), and Manchester City (2009-10) before moving to Cardiff City in 2010. He stayed until his retirement in 2014. Along the way, Bellamy was accused of assault in four separate instances, though never convicted. Most recently, he was arrested in Cardiff in January 2011 for an alleged assault on two men. Bellamy debuted for Wales in 1998 and rose to captain the team in 2006. He made 78 national team appearances and has scored 19 goals to place sixth on the list of the Wales national team's top scorers. Labels: Cardiff City FC, Craig Bellamy, Liverpool F.C., Manchester City FC, Newcastle United F.C., Wales, West Ham United F.C. 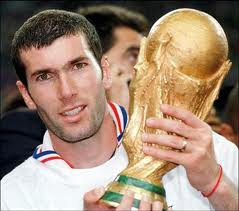 On 12 July 1998, hosts France won the World Cup, beating Brazil 3-0 with a brace from midfielder Zinedine Zidane (pictured). Going into the match, Brazil appeared to have the edge on offense with a powerful attack that included the likes of Ronaldo--who had scored four goals in the tournament--as well as Bebeto, Rivaldo, and César Sepaio, who had scored three goals each. For France, meanwhile, only Thierry Henry (3) and Lilian Thuram (2) had scored more than once. Defensively, however, France had the advantage, having conceded only two goals in the earlier rounds while Brazil managed to keep only a single clean sheet. Ronaldo was doubtful for the match, having gone into convulsions the night before, but Brazil made a very late decision to include him in the starting lineup. Playing before a crowd of approximately 75,000 at the Stade de France in Saint-Denis, Zidane provided the opening goal with a header in the 27th minute. It was the first goal of the tournament for the Juventus star, who then provided a second in quick fashion, doubling the lead right before the break. Although the French defensive midfield pair of Didier Deschamps and Christian Karembeu did well to disrupt the Brazilian attack, Ronaldo still had a couple of decent chances, but was unable to convert. Even after France went down a man in the 68th minute after Marcel Desailly received a second yellow card, the Brazilians could not take advantage. Midfielder Emmanuel Petit then provided the capstone to the victory with a goal in the 90th minute. It was the completion of an annus miribilis for Zidane, who had already won that year's Serie A title and reached the Champions League final with Juventus. He went on to claim the 1998 Ballon d'Or and the FIFA Player of the Year award as well. 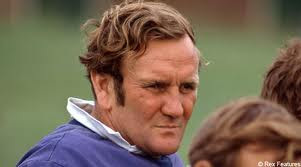 On 11 July 1977, Don Revie became the first manager to resign from the English national team. At the time, he had the worst winning percentage of any full-time England manager. Revie had risen to prominence at Leeds, having joined them as a player in 1958, then taking over as manager in 1961 (he served as player-manager for one season before retiring as a player in 1962). He took them from the Second Division to the league champions, winning the top flight in 1969 and 1974. Along the way, he also won the Inter-Cities Fair Cup twice (1968, 1971), the FA Cup (1972), and the League Cup (1968). After winning his second league title in 1974, the Football Association picked him as the replacement for World Cup-winning boss Alf Ramsey (Joe Mercer served briefly as caretaker in the interim). But Revie was unable to repeat the success he had enjoyed at Leeds, as England missed out on qualification for the 1976 European Championship and the 1978 World Cup. In all, England claimed only fourteen wins in 29 matches during his tenure, for a winning percentage of 48.3%. Revie's departure created a firestorm. He resigned to take charge of the United Arab Emirates national team for a reported 4-year contract worth £340,000. That was controversial enough, but rather than issue a statement through the FA, he sold the story to the Daily Mail. The FA responded by suspending him for 10 years for "bringing the game into disrepute," but Revie successfully overturned the ban in court. He left the UAE post in 1980 and managed Riyadh's Al-Nassr (1980-84) and Cairo's Al-Ahly (1984-85) before retiring to Scotland, where he passed away in 1989. On 10 July 1949, Inter Milan opened their North American tour with an 8-2 win over the New York Stars at Randall's Island. It was the first of a six-match itinerary in the United States and Canada that ended with six Inter victories. Led by captain Aldo Campatelli, Inter were coming off a second-place finish in the 1948-49 Serie A season, helped by the performances of István Nyers and Amedeo Amadei, who had finished as league's highest and second-highest scorers with 26 goals and 22 goals, respectively. As evidenced by the eight goals they put past the New York Stars, Inter's offensive power proved too much for the North American teams, all of whom were all-star sides put together for the tour. The Italians followed that performance with five more victories; 12-4 over Kearny-Philadelphia, 5-0 over the American League Stars, 9-3 over the Montreal Stars, 5-1 over the U.S. Stars, and--in their closest match of the tour--4-2 over the Philadelphia Stars. 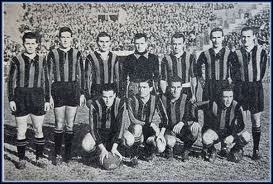 After returning to Italy, Inter recorded another second-place league finish in 1951, then won the league in 1953 and 1954. Soon afterward, manager Helenio Herrera arrived to usher the club into their Grande Inter phase, winning seven trophies between 1963 and 1966, including the 1964 and 1965 European Cups. On 9 July 1989, Trinidad and Tobago won the inaugural Caribbean Cup, beating Grenada 2-1 with a brace from 17-year old striker Dwight Yorke, making his first appearance for the Soca Warriors. Six teams qualified for the tournament and were split into three groups, with the two group winners paying for the title. In Group A, all three teams finished on two points with a win and a loss each. Trinidad and Tobago and Guadeloupe both had the same goal differential (+1), but T&T claimed the top spot by virtue of having scored three goals to Guadeloupe's two (hosts Barbados were at the bottom thanks to a goal differential of -2). The winner of Group B was more straightforward, as Grenada managed a win and a draw to finish with 3 points, ahead of the Netherlands Antilles (2 points) and St. Vincent and the Grenadines (1 point). 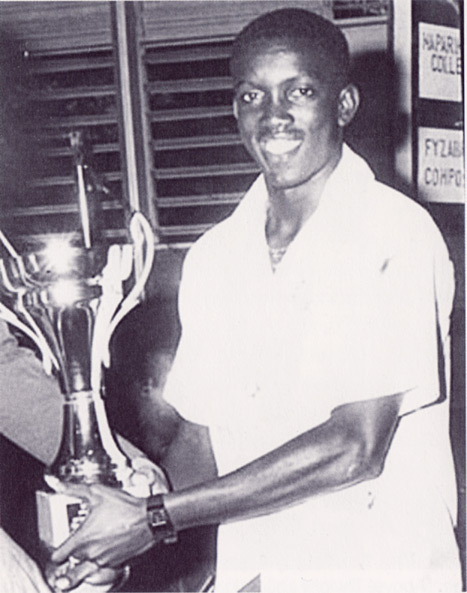 The teams met in Bridgetown, Barbados for the final, where Trinidad & Tobago took a first-half lead with a 24th-minute goal from Yorke (pictured, holding that year's T&T Secondary Schools Football League trophy). They held onto the lead for most of the match, but Grenada's Wayne Hood equalized in the 84th minute. Yorke then provided the match-winner five minutes later. It was the first of their record eight titles. Yorke, who played for his high school, Signal Hill, at the time, went on to sign with Aston Villa later that year and spent nine seasons there, scoring 73 goals in 232 league appearances. He spent a total of 18 years in England and also played for Manchester United (1998-2002), Blackburn Rovers (2002-04), Birmingham City (2004-05), and Sunderland (2006-09), as well as one season with Australia's Sydney FC (2005-06). 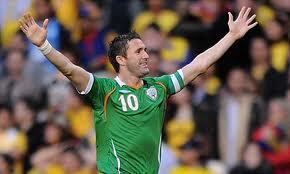 On 8 July 1980, L.A. Galaxy striker and all-time Republic of Ireland scoring leader Robbie Keane was born in Dublin. Keane began his professional career in 1997 with Wolverhampton and scored twice on his debut for the club. After only two seasons there, he moved to Coventry City in 1999 for £6 million, a British record at the time for a teenager, and again notched a brace on his club debut. He stayed with Coventry for only a single season and spent the next three seasons with three different clubs: Inter (where he made only 6 appearances in the 2000-01 season), then Leeds United (where he played from 2000-02), and Tottenham. He enjoyed relative stability at Tottenham, playing there for a total of eight seasons from 2002 to 2011, broken by short spells at Liverpool (19 appearances in the 2008-09 season), Celtic (16 appearances in the 2009-10 season), and West Ham (9 appearances in the 2010-11 season), before moving to the Los Angeles Galaxy in 2011. Over the course of his club career, he has scored 312 goals in 708 appearances. In 1998, while still with Wolves, Keane earned his first cap for Ireland. He has since played for them a total of 108 times. In September 2004, he scored his 21st goal for Ireland to match the record set by Niall Quinn, then passed it with a brace the next month. His current tally stands at 67. Labels: Coventry City F.C., Niall Quinn, Republic of Ireland, Robbie Keane, Tottenham Hotspur F.C., Wolverhampton Wanderers F.C. 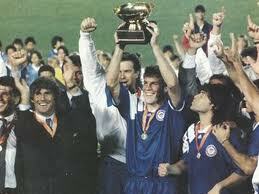 On 7 July 1991, the United States won the inaugural CONCACAF Gold Cup, beating Honduras on penalties, 0-0 (4-3). Played in the Californian cities of Pasadena and Los Angeles, the 1991 Gold Cup included eight teams from North and Central America. As hosts, the US qualified automatically, while Honduras earned their place as runners-up to Costa Rica in the Central American qualifying tournament, the UNCAF Nations Cup. The teams were split into two groups of four. In Group A, Honduras dropped only a single point thanks to a 1-1 draw with Mexico, but topped the group on goal differential. They then advanced to the final with a win over Costa Rica. Meanwhile, the US won Group B with victories in all three matches, then beat Mexico 2-0 in the semifinal. The final was played before a crowd of 39,873 at Memorial Coliseum in Los Angeles. There, the two teams battled to a scoreless stalemate at the end of extra time to send the match into a penalty shootout. Honduras went into the shootout with their reserve goalkeeper, Wilmer Cruz, who had replaced their starting keeper, Belarmino Rivera, in the 119th minute. After five kicks each, the teams were level at 2-2, so they moved into sudden death. After seven kicks each, they were still level, with each side having made one and missed one of their intervening kicks. US defender Fernando Clavijo then converted the next attempt--the Americans' eighth--to take the lead. Juan Carlos Espinoza stepped up for Honduras, but rifled his shot over the bar as the US claimed the victory. It was the first major trophy for the US, who have since won the tournament a total of five times. Honduras, who won the CONCACAF Championship in 1981, have yet to return to the Gold Cup Final.